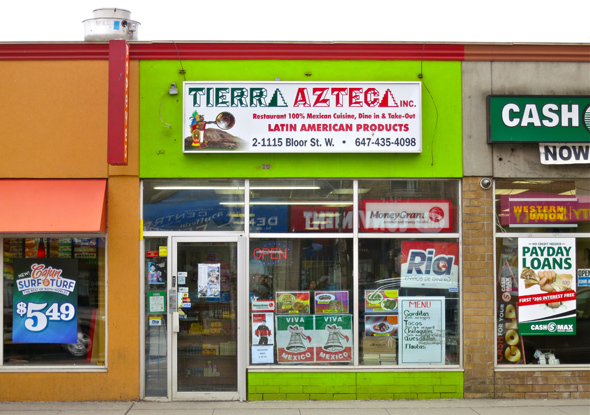 Tierra Azteca at Bloor and Dufferin offers Mexican and a smattering of Latin American cuisine. It's a grocery store that doubles as a restaurant and money wiring facility. It's small, simple, authentic, and slightly inaccessible. All of these qualities add to Tierra Azteca's charm. In what is surely a nod to their cramped kitchen as opposed to any advice received from Gordon Ramsey, Tierra Azteca offers a small (tiny really) weekday menu that barely comprises a whole page (two if you count the photos). Six dishes are available, offered with a choice of beef, pork, veggies or chicken though a weekend menu (featuring tripe amongst other things) is slightly more extensive. It's a menu that is mostly hit with a bit of miss, with some dishes requiring second and third tastings to crown an overall champion. Best on this day are the Sopes ($10), a traditional Mexican dish of refried beans topped with meat and/or veggies and cheese, served on a lightly fried corn tortilla soaked in lime - a sort of flat taco pizza where the ingredients are pushed to the very edge of the tortilla, like something Pizza Hut would have tried in the 90s if they served tacos. An order of three veggie Sopes arrive with two topped with mushrooms and one topped with a mixture of onions, peppers and corn. The mushroom Sopes are bursting with flavour, deep and rich, and would appeal even to a non-mushroom lover. 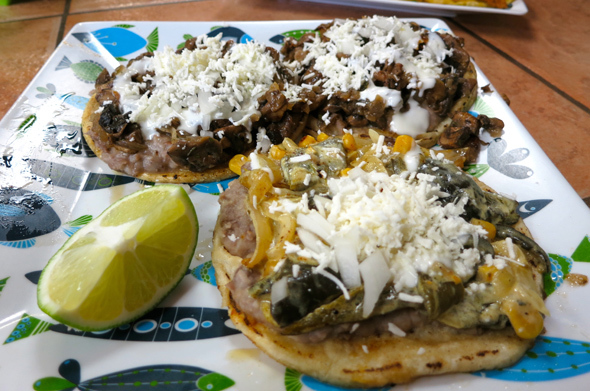 They're topped by the other Sope on the plate (the corn, onion and peppers iteration) which is also on a bean base and bathed in a delicious and aromatic sauce and highlighted by perfectly cooked green pepper. 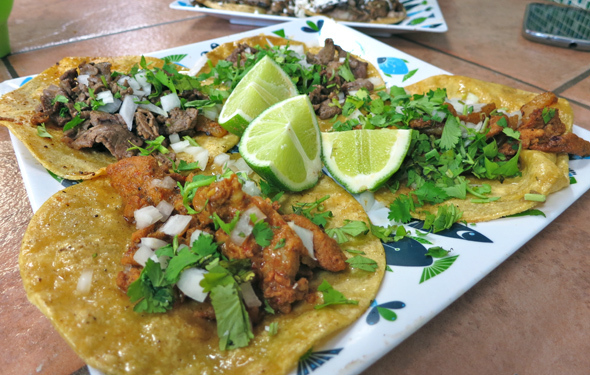 An order of four tacos ($10), two El Pastor (pork) and two Chorizo (pork sausage), is lost in translation and results in two El Pastor and two Steak tacos. Both are extremely simple - meat, onions, and in the case of the El Pastor, pineapple and a whack of cilantro. The El Pastors don't disappoint, with pork as flavourful as you could hope for, and tender to boot. The Steak tacos are, in comparison, a disappointment. The steak isn't bad - a little tough with some flavour - but isn't enough to carry the dish, even with the addition of a spicy and flavourful salsa verde provided on the side. Last on the day are the Chilaquiles ($10), a Mexican comfort breakfast/brunch food of beans and tortillas. The tortillas are fried and then quickly simmered with salsa to create a deeply delicious and aromatic corn dish almost akin to a polenta or grits. 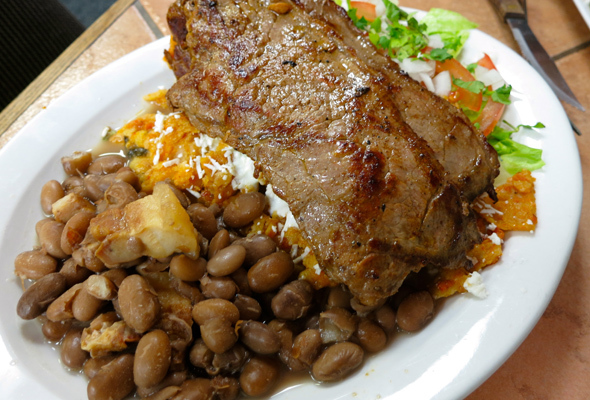 Tierra Azteca's Chilaquiles are topped by two thinly sliced cuts of steak - chicken or eggs are the other options - and a very standard and perfunctory side salad. The beans are a non-entity, larded with fat and somehow possessing very little in the way of flavour. The steak is well cooked and a bit plain Jane, but is elevated by the strong pairing with the tortillas (which are phenomenal) and some Mexican crema. Ultimately the individual components of the dish that work are enough to outweigh the ones that don't. The vibe at Tierra Azteca is very back-roomish , as the restaurant portion of the operation is in fact (not quite literally) a back room. 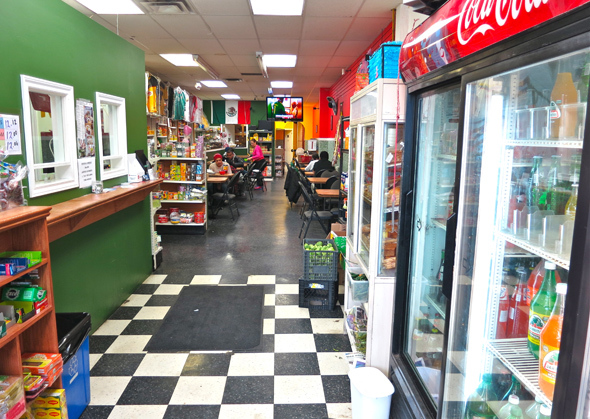 The restaurant doubles as the rear of a busy grocery store with an a array of Mexican and Latin American products that can be hard to find around Toronto, in particular a great array of peppers. And it's always nice to find a grocery store that carries cacti. While the food is mostly good value, service at Tierra Azteca can be a bit of a challenge, particularly if you don't speak Spanish. We go long stretches without seeing either the waitress or the chef (who was pressed into service duty on this day) and after an hour meal we walk out without having received water. Fortunately there is an array of drinks and Mexican pops, and the food is none too spicy. 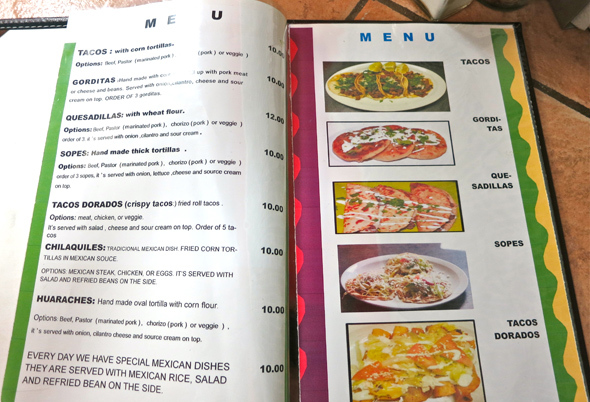 Still, the charming nature of the food - authentic, and often delicious - is enough to overlook some misfiring elements in both the dishes and the overall dining experience, and large portions and cheap prices - nothing on the menu is over twelve dollars - make this place one of Toronto's better kept Mexican secrets. Tierra Azteca is open from 10 am to 8 pm Monday-Saturday and 10 am - 6 pm on Sundays. Writing by Anders Whist. Photos by Miranda Whist.